The book so many people have been waiting for. Innovative cook Danielle Bowater shows how to create delicious party finger food with ease – and present it with style and aplomb. 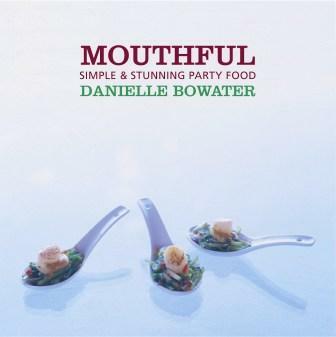 With its fresh, uncomplicated recipes and inspired ideas for party-giving, Mouthful is set to become a standard in the kitchen of everyone who loves to cook, eat and entertain. Danielle Bowater, a bright new star in the galaxy of food, presents a collection of delicious recipes that can be accomplished with ease in a home kitchen. Old favourites such as mini beef pies and corn fritters are joined by eclectic flavours from the world’s great cuisines: spring rolls of Vietnam, red pepper and olive pissaladiere of France, fish cakes of Spain, and many more. Mouthful is more than a cookbook. It is a cornucopia of practical information for the party-giver, from serving the perfect drink to creating a welcoming and memorable ambience. Above all, it is an invaluable guide to entertaining without stress, so you enjoy the party as much as your guests. Danielle Bowater has had wide experience in the world of food – gourmet pizza maker, barista and cafe worker, deli diva, caterer and restaurant/bar manager – but this is a book for the everyday cook, featuring readily available and familiar ingredients, easily mastered cookery skills and simple equipment.